which has a chapter on Easter Island. Click here for the fastest, easiest and cheapest quote for car rental in 6000 locations in 120 countries. Inexpensive Text Ads Find out more about our wide range of banner and text advertisements at low annual rates. Choose your pages for valuable context sensitivity. FREE ADS for travel articles! Trek back to Hanga Roa around the road-free northwest corner of the island...This is probably the finest coastal walk in the South Pacific. Ask me which Pacific island has the most to offer hikers and I'll probably answer Easter Island. Here on an island 11 km wide and 23 km long you'll find nearly a thousand ancient Polynesian statues strewn along a powerfully beautiful coastline or littering the slopes of an extinct volcano. The first morning after arrival, I suggest you climb Easter Island's most spectacular volcano, Rano Kau, where Orongo, a major archaeological site, sits on the crater's rim. But rather than marching straight up the main road to the crater, look for the unmarked shortcut trail off a driveway to the right just past the forestry station south of town. It takes under two hours to cover the six km from Hanga Roa to Orongo, but bring along a picnic lunch and make a day of it. (If climbing a 316-meter hill sounds daunting, you can take a taxi to the summit for around US$6 and easily walk back later in the day.) Once on top, you'll find hiking down into the colourful crater presents no difficulty. 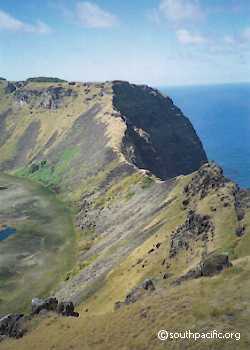 It may also look easy to go right around the crater rim, but only do so if you're a very experienced hiker and have a companion along as shear 250-meter cliffs drop into the sea from the ridge. Another day, rise early and take a taxi to lovely Anakena Beach at the end of the paved road on the north side of the island (you should pay under US$10 for the 20 km). A few of the famous Easter Island statues have been restored at Anakena and you could go for a swim, although the main reason you've come is the chance to trek back to Hanga Roa around the road-free northwest corner of the island. You'll pass numerous abandoned statues lying facedown where they fell, and the only living creatures you're unlikely to encounter are the small brown hawks which will watch you intently from perches on nearby rocks. If you keep moving, you'll arrive back in town in five or six hours (but take adequate food, water, and sunscreen). This is probably the finest coastal walk in the South Pacific. Almost as good is the hike along the south coast, although you're bound to run into other tourists here as a paved highway follows the shore. 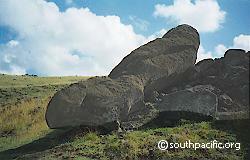 Begin early and catch a taxi to Rano Raraku, the stone quarry where all of the island's statues were born. This is easily the island's most spectacular sight, with 397 statues in various stages of completion lying scattered around the crater. Each day large tour groups come to Rano Raraku to sightsee and have lunch. However, if you arrive before 9 am, you'll have the site to yourself for a few hours. When you see the first tour buses headed your way, hike down to Ahu Tongariki on the coast, where 15 massive statues were reerected in 1994. From here, just start walking back toward Hanga Roa (20 km) along the south coast. You'll pass many fallen statues and enjoy some superb scenery. Whenever you get tired, simply go up onto the highway and stick out your thumb and you'll be back in town in a jiffy. An outstanding 13-km walk begins at the museum and follows the west coast five km north to Ahu Tepeu. As elsewhere, keep your eyes pealed for banana trees growing out of the barren rocks as these often indicate caves you can explore. 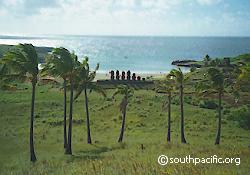 Inland from Ahu Tepeu is one of the island's most photographed sites, Ahu Akivi, with seven statues restored in 1960. From here an interior farm road runs straight back to town (study the maps at the museum carefully, as you'll go far out of your way if you choose the wrong road here). A shorter hike takes you up Puna Pau, a smaller crater which provided stone for the red topknots that originally crowned the island's statues. There's a great view of Hanga Roa from the three crosses on an adjacent hill and you can easily do it all in half a day. A different walk takes you right around the 3,353-meter airport runway, which crosses the island just south of town. Near the east end of the runway is Ahu Vinapu with perfectly fitted monolithic stonework bearing an uncanny resemblance to similar constructions in Peru. Easter Island's moderate climate and scant vegetation make for easy cross country hiking, and you won't find yourself blocked by fences and private property signs very often. You could also tour the island by mountain bike, available from several locations at US$10 a day. If you surf or scuba dive, there are many opportunities here. A minimum of five days are needed to see the main sights of Easter Island, and two weeks would be far better. The variety of things to see and do will surprise you, and you'll be blessed with some unforgettable memories. 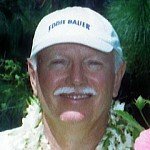 If you enjoyed reading the above article then you will probably also enjoy Samoa by David Stanley, and the Whitsunday Islands, also in Australasia, and our latest articles covering the Orinoco Delta, La Mata, Marbella and Beijing. A murder mystery - told by an autistic version of Adrian Mole! 15-year-old Christopher John Francis Boone is mathematically gifted but socially hopeless, taking everything at face value. He resolves to discover who has murdered Wellington the dog. With a fast-paced plot that never quits and a surprise ending no reader will see coming, Jemima J is the chronicle of one woman's quest to become the woman she's always wanted to be, learning along the way a host of lessons about attraction, addiction, the meaning of true love, and, ultimately, who she really is. 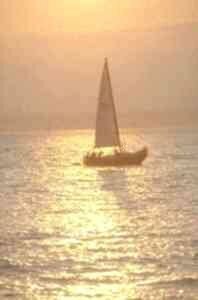 A wonderful novel which follows the life of ace US Marine fighter pilot Jack McGuire. Trying to rebuild his life post WW2, he moves to the Solomon Islands, where he builds a hotel on an island he flew over in his combat years. From his days on the family farm and the trauma of the loss of his twin brother, through flying school to his war service and retirement, we share his hopes and disappointments, his exhilarations and despairs.